General Stanley McChrystal, retired Commander of U.S. and International Security Assistance Forces in Afghanistan who revolutionized the way military agencies coordinate counter-terrorism efforts, will reflect on the U.S. since 9/11 during a free public talk on Friday, Sept. 14, at Duke University. A four-star general, McChrystal led the Joint Special Operations Command, which oversees the military's most sensitive forces. His leadership of the JSOC is credited with the capture of Saddam Hussein in 2003, and the death of the Iraqi Al-Qaeda leader Abu Musab al-Zarqawi in 2006. 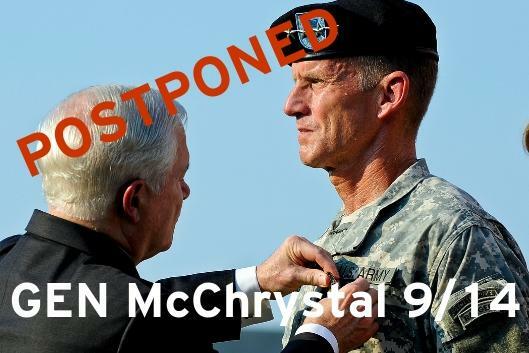 "Seventeen Years at War: A Conversation with General Stanley McChrystal," will include an audience Q&A. This Terry Sanford Distinguished Lecture will take place in the Sanford School of Public Policy's Fleishman Commons, 5 - 6:15 p.m. Parking is available for a fee in the Bryan Center Visitor Deck.